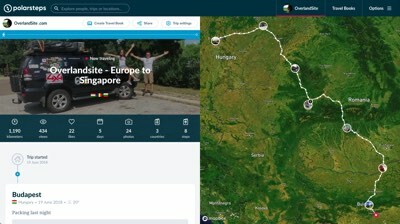 If you end up in Laos with your own vehicle, chances are you’re traveling from Singapore or Malaysia (perhaps all the way from Australia) to Europe, or from Europe to Malaysia or Singapore. Thailand: As with China, a guide and pre-arranged paperwork are required. However, this rule isn’t enforced consistently - this is where it gets interesting! 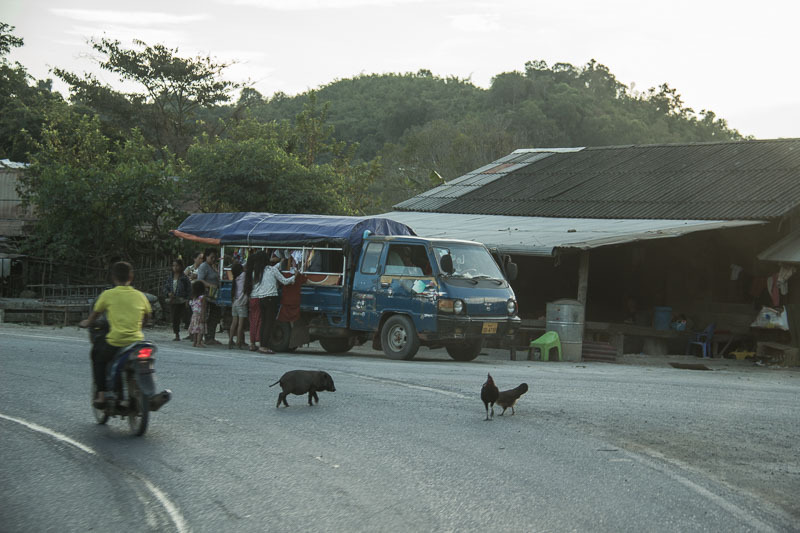 Myanmar: I’ve heard a rumor that a Lao-Myanmar border has opened. If you choose to travel through this country though, you’ll need a guide and a whole lot of papers. 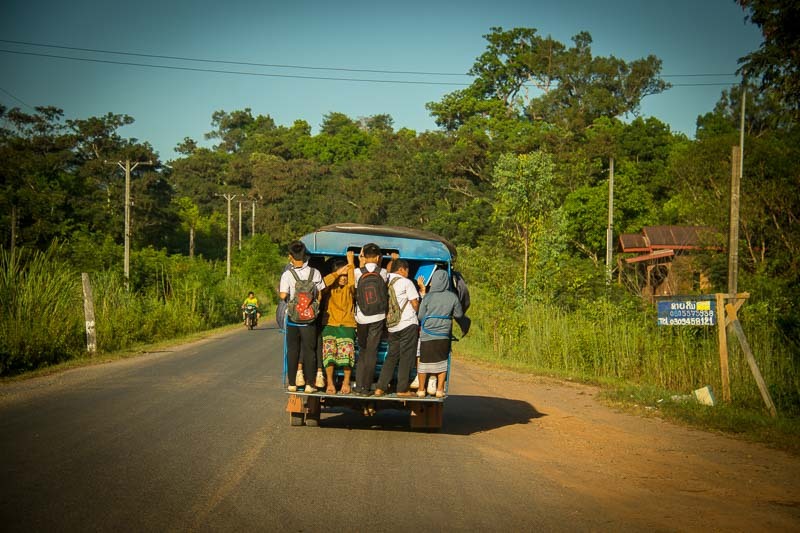 So as you can see, no matter which direction you’re going, it’s not easy to leave Laos at all. In fact, according to official Lao regulations, you need to have a guide for this country too, although this rule is not enforced at all and we were able to enter from China without any issues. This might get more difficult over time, though. What the actual reasons are for these silly regulations, I don’t know, but they make overland travel very difficult in the region. As we’re on our way from Budapest to Singapore, we entered at Botan from the north of China. As I mentioned, entering the country was relatively easy. Getting a 30-day visa costs around $30 for most nationals. Additionally, you’ll need to import the vehicle into the country. 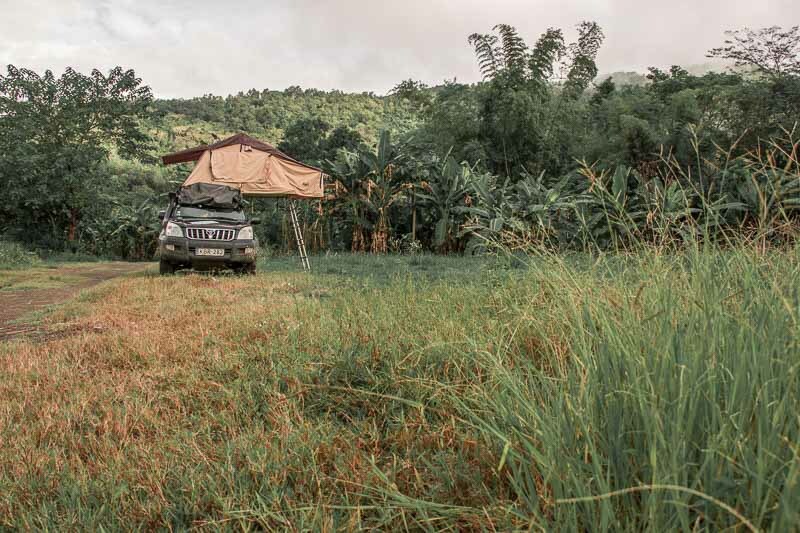 After filling in a form, paying 25,000 Kip (about $3 - yes, three US Dollars) for a regular 4x4 vehicle like ours, you’ll be issued the TIP, the Temporary Import Permit. It’s very important not to lose this document, as you’ll need to present it when leaving the country. 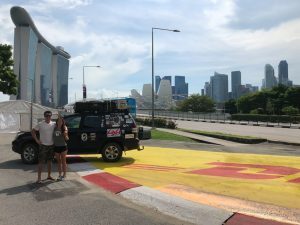 You can arrange the insurance at the Chinese side of the border in advance, which is what we did, but this can be purchased right after entering the country as well. Both the visa and the TIP are valid for 30 days but can easily be extended in the capital, Vientiane. 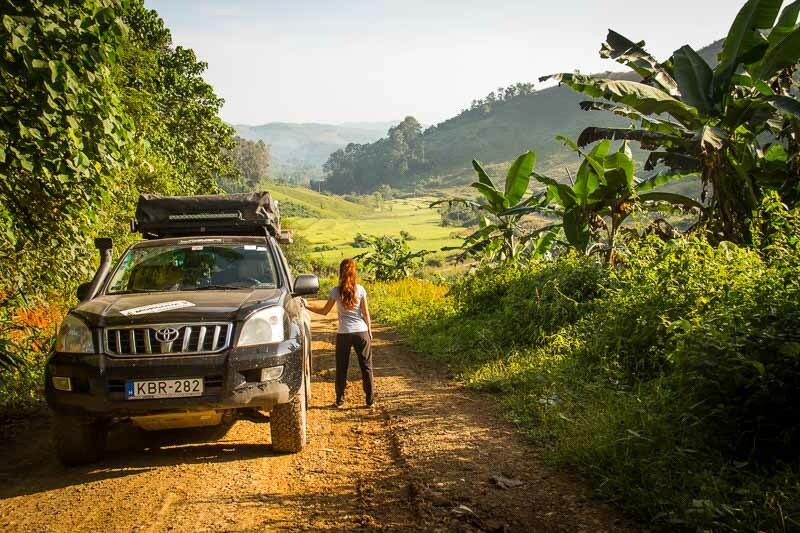 Since you’ll be traveling with your vehicle and Lao roads are not as good as in the surrounding countries (not talking about Myanmar here), you need to make sure to travel outside of the rainy season. This is especially important if you plan to do a bit of exploring off the main tourist trail. For this reason, the best time to visit Laos is from October to late April. We still had some heavy showers and storms, but mostly the weather was hot and dry. 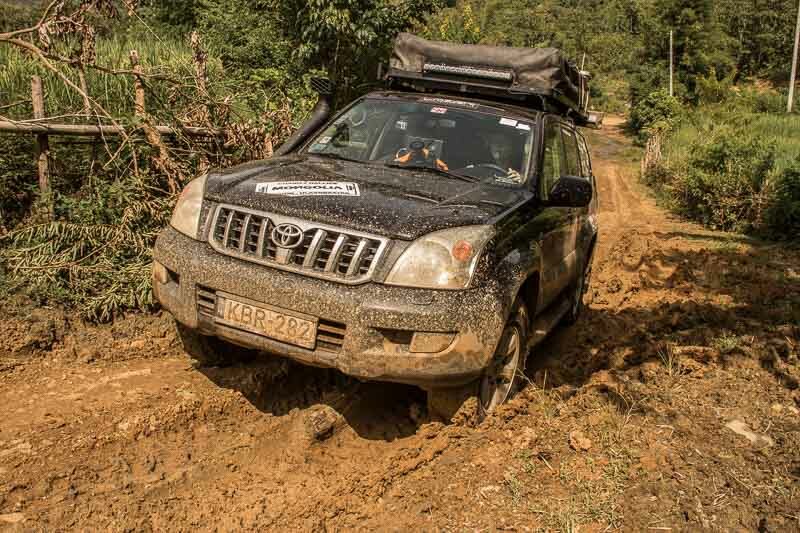 On our first day in Laos, in order to drive on a road that was recommended to us by our friends from All You Can East, we managed to drive on a great dirt track with lots of mud, which was a lot of fun! However, if it’d been the rainy season, driving on that particular road would have had been virtually impossible. 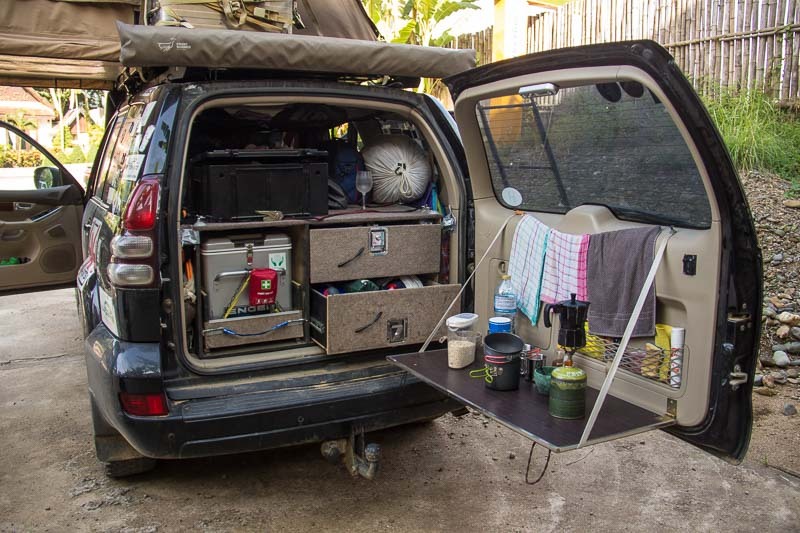 Whether you’re entering from the north or the south, you’ll probably end up driving on more or less the same route as most overlanders. 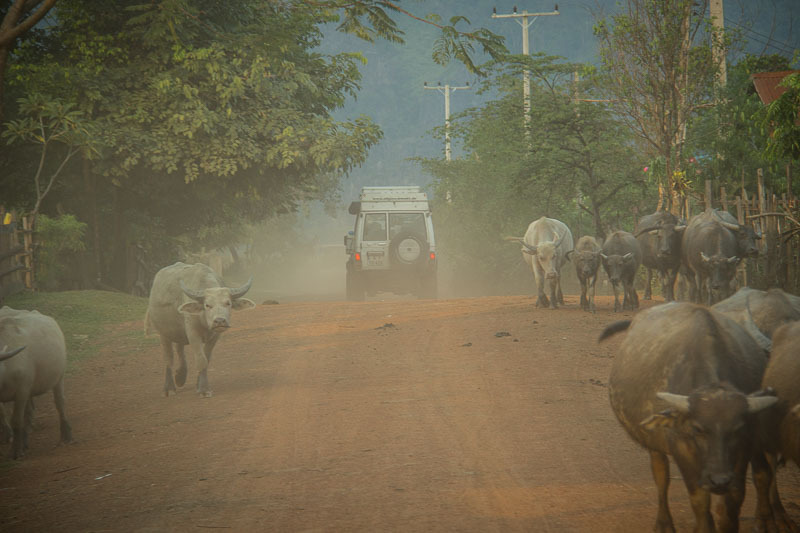 The main corridor through the country is the Luang Prabang - Vang Vieng - Vientiane - Pakse route, but you can make a lot of detours to discover this amazingly beautiful country. 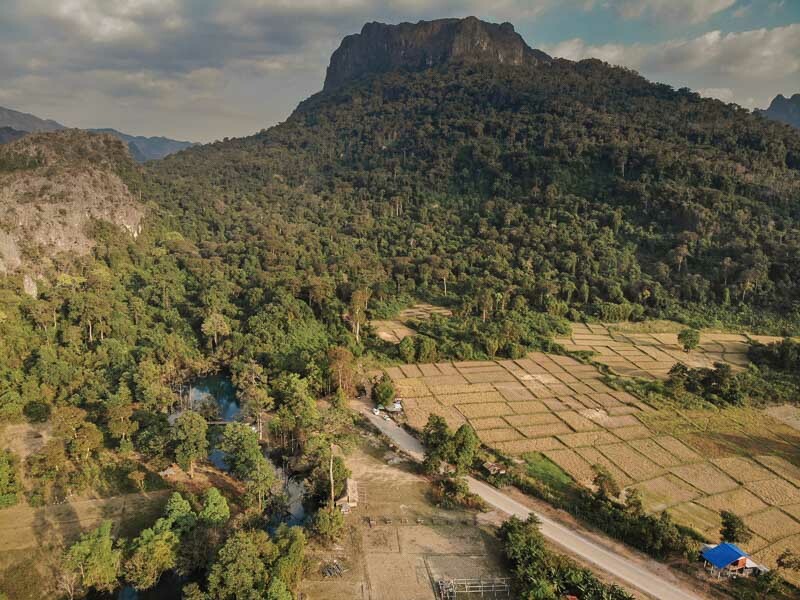 Coming from the north, the first little adventure I’d recommend is to turn off of the main road and drive in on the narrow trail toward the Chom Ong Cave. The turn-off is at 20.802351, 101.863075. The road is only visible on the satellite images of Google Maps, so you’re better off using Maps.me here. We didn’t go inside the cave since there was nobody there, but driving through the villages on this road, through rice fields and beautiful hills, is an experience on its own. You’ll have plenty of opportunities to visit caves elsewhere in the country. People are quite shy in these villages, as they probably don’t see foreigners too often. It was very late in the afternoon when we ended up on this road, so we chose to camp in the school yard of the first village. Locals came three times to check who we are, so we asked for permission to stay for the night. Once you’re on this trail, you can do a small tour, only entering the main road at Muang Xay. It’s well worth the 3-4 hours that it takes to drive this part. From here you can reach Luang Prabang with just a half day’s drive. Luang Prabang must be one of the highlights for tourists in this country. The colonial buildings, great restaurants and cafes, and beautiful scenery at the Mekong make it a perfect place to stop for a few days. And that’s exactly what we did. We stopped in Luang Prabang for 3 days. We strolled the night market and ate great food in the Old Town while the rooftop tent had a chance to completely dry out after the humid morning in the school yard up north. Once you’re in Luang Prabang, we did what everybody does and visited the Kuang Si Waterfall. As touristy as it is, don’t miss it if you’re there, but make sure you go just after the park opens at 8.00am, because you’ll have a chance to enjoy it and swim without anybody around. From an overlanders point of view, however, it was after the waterfall when our day got a lot more interesting. 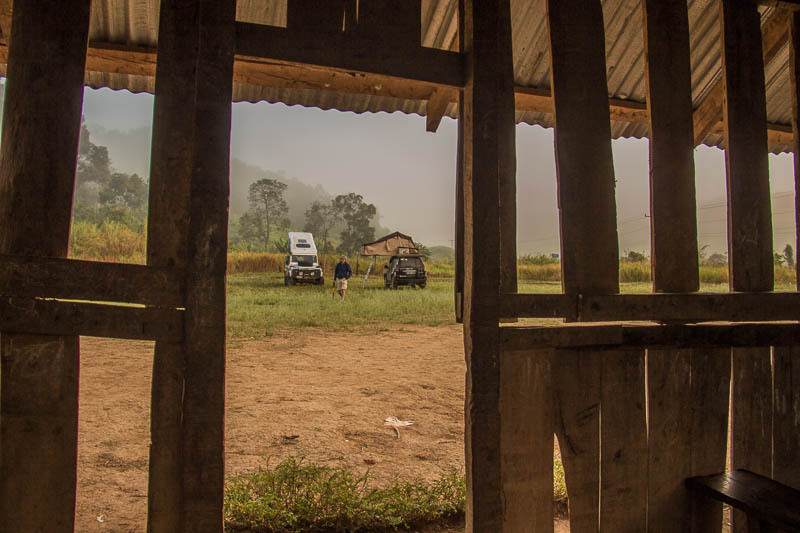 We were headed to Vang Vieng but instead of taking the main road (No.13) full of trucks and potholes, we decided to go along the Mekong River on route No.1. Despite the name, this route is no more than a very narrow track that’s not even suitable for larger vehicles. There were some points where we could barely fit through the gap between trees. You can hardly reach 20 miles an hour, so make sure you factor that in should you choose to go this way. I’d recommend you do! Unless you’re 20, you probably won’t really enjoy Vang Vieng. Having said that, I was 30 when I did the infamous tubing. I have great memories from that day, but wasn’t keen on a repeat experience. 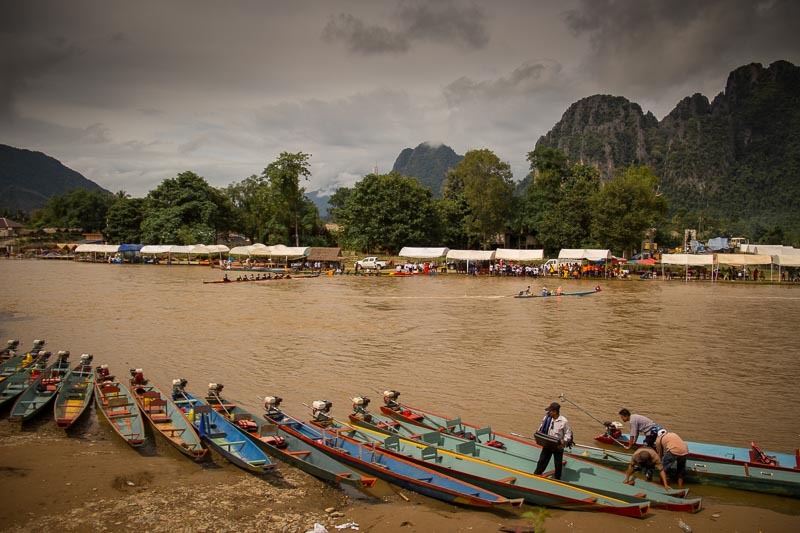 But Vang Vieng, and especially its surroundings, have a lot more to offer than just the tubing. 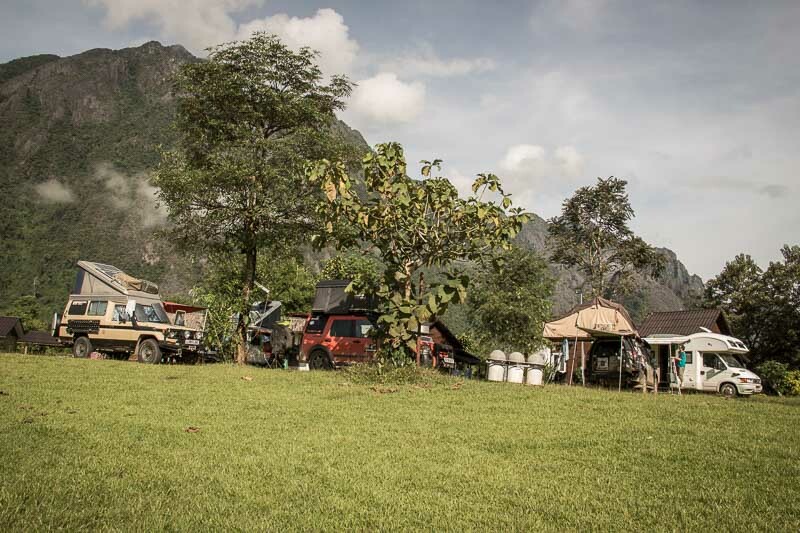 A great place to stay as an overlander is the Eco Lodge just outside the town. This place has been built recently and offers a large grassy area for campers with really clean toilets and showers. There’s a restaurant on site and the staff are super friendly. 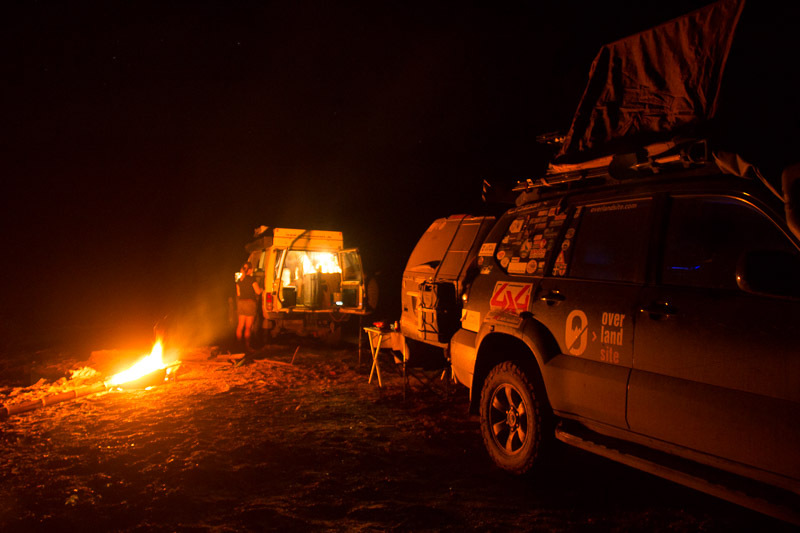 There was a sizeable spontaneous overlanders’ meeting at the time we were arriving. Once you’ve traveled half the globe you’ll end up meeting people you’ve met before, and through them meet even more travellers. 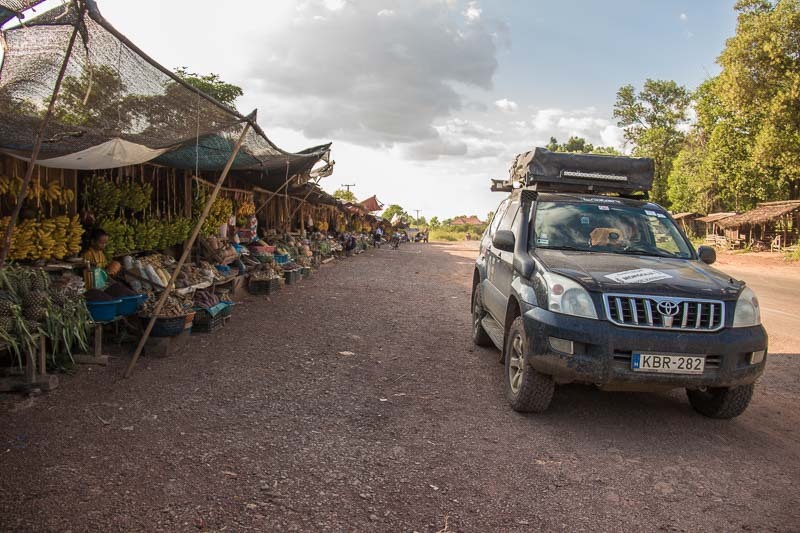 We were the 6th vehicle to arrive and it was great to see Joanna and Richard from Kiwis in Africa and Clemence and Paul from All You Can East again. We met Clemence and Paul briefly in Georgia when we drove past each other (exchanging only a few words) in the Tusheti National Park (still one of the highlights of this trip). Joanna and Richard were also at the Horizons Unlimited meeting in Ulaanbaatar. It was great to meet all these guys again! 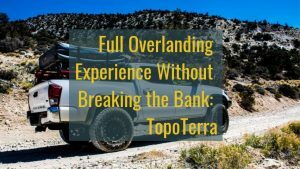 We caught up several other overlanders that we’ve ‘met’ or ‘known’ online from various Facebook groups or from Polarsteps. 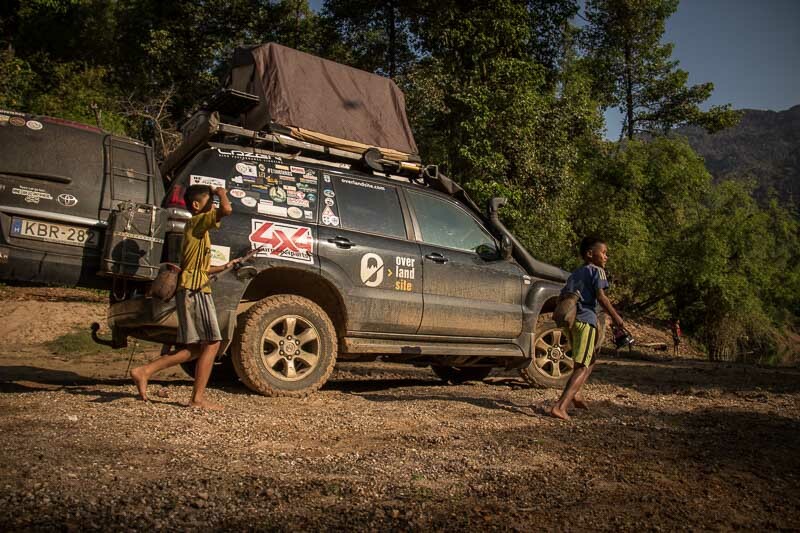 It was a great evening, everybody sharing their experiences driving from Europe all the way to Laos and still carrying on. 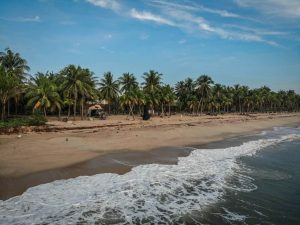 If you’re in the area, there are several caves that you can visit, and renting a motorbike is a great way to discover villages on the other side of the river. The capital city wasn’t my favourite destination in Laos. I thought we’d only do some grocery shopping, get an oil change and then travel further south, but later we had a chance (or were basically forced - more on that later) to see more of the city, and the change since 2011 (when I visited for the first time) was remarkable. There’s now a buzzing nightlife, the city is full of expats and new buildings have sprung up everywhere. Since we had issues entering Thailand a week later, we had to come back to Vientiane. Despite the issues we were having during those days (Thai authorities wouldn’t let us cross into Thailand), I have to say we had a great time in the city. 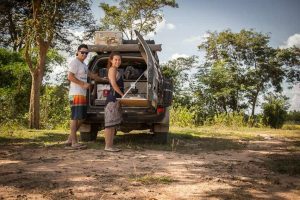 Andy and Meera, a couple moving from their 5-bedroom house in Vientiane into a converted truck in Europe, showed us how great Vientiane’s nightlife is. Live music and good beer, not much more is needed! 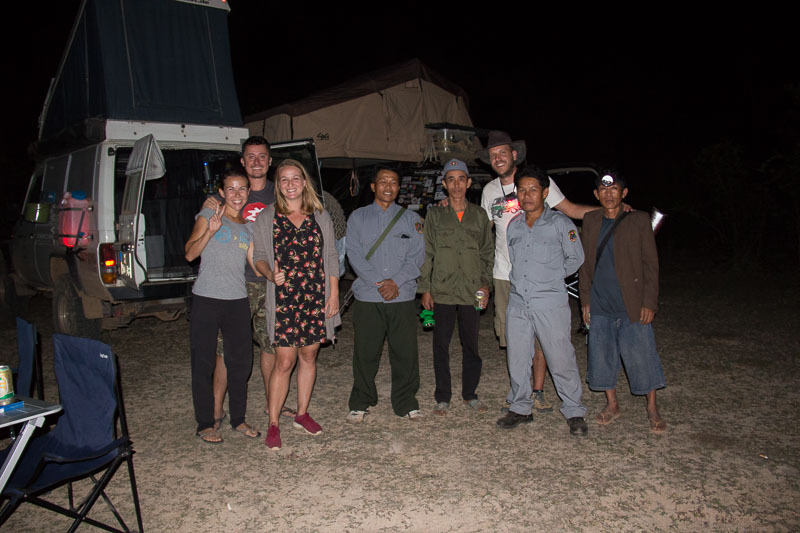 I believe The Loop originates from the Travelers Lodge guest house in Thakhek, where backpackers can rent motorbikes to do a loop on route No. 13, No. 12. and No. 8. 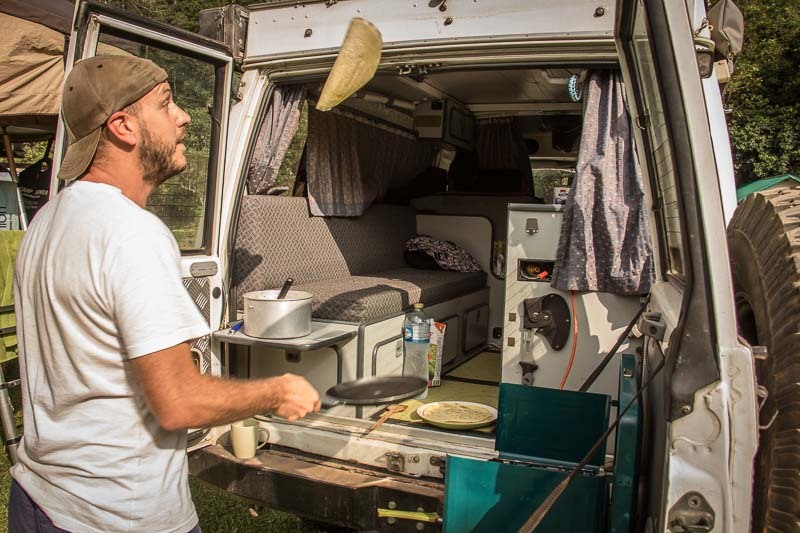 Today The Loop has become an official tourist trail, and as an overlander you have your own vehicle, which is the best way to see this part of the country. The scenery on the southern part of route No. 12. On one of our last wild camping nights on route No. 12, some guys dressed in military uniform and equipped with AK-47’s sent us away for reasons we never found out. It was no time for an argument though, as some of them were also drunk. There were all nice and polite but we thought it best not to argue, so at midnight we had to pack up our camp and look for another spot. In the dark we managed to set up our new camp in a forest, but in a way that the hot morning sun was shining right on us, forcing up to get up early. 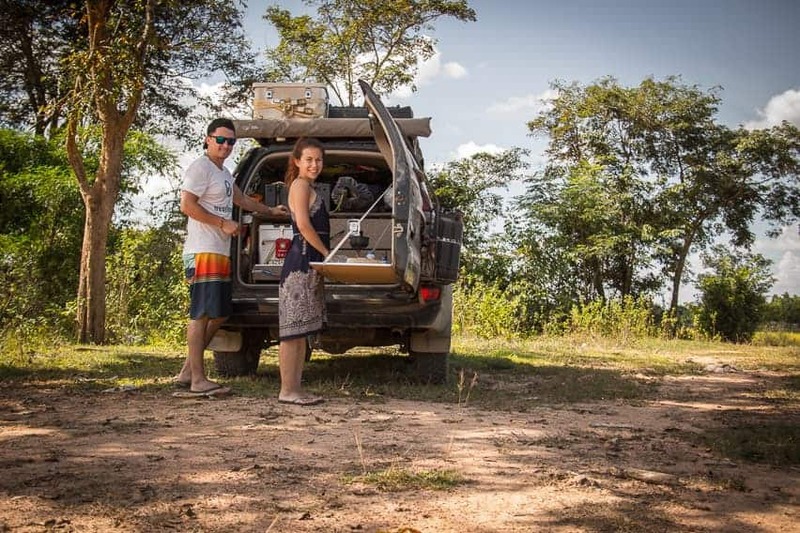 It can be extremely hot in Laos, so make sure you have a portable fan in your tent at all times. After The Loop it was time for us to leave for Thailand. Or so we thought, but the border guards on the Thai side were of a different opinion, and so began our hurdle to somehow enter Thailand with our vehicle. More on this in the next post, as the story deserves a separate article.